Libra Traits - Known as the intuitively intelligent sign of the zodiac. Libra Traits - The individual born into this sign is at best where their natural inclination towards harmony and balance is there. Here is a quick visual guide to Libra Traits. This means they are impacted by negative energies in the work environment and also the visual surroundings of where they are. This can throw them off their game. You are easy going, and pleasant to be around. You don't like upheaval and are very strategic at taking care of things so that things remain 'in balance'. Your natural charming manner allows you the ability to get want you want. You love to socialize. 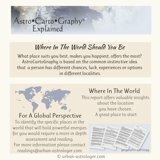 You will go to great lengths to create the appropriate atmosphere. You are diplomatic and gracious. You like to bring harmony and peace to the world and into the lives of others. 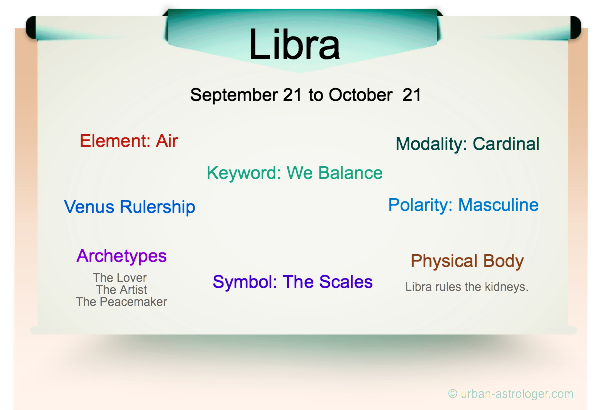 The	glyph for Libra represents the Balance. Libra	is the 7th sign of the zodiac, a cardinal sign and of the air element. The ruling planet is Venus. The Sun enters the sign of Libra around 21 September and exits around 21 October. . Symbolically the written symbol of Libra is made up of two lines that resemble the cross beam of a scale. The traits of this sign are indecisive, just, sophisticated and intuitively intelligent.